I joint you in supporting Obama. He inherited a mess and has been in office less than a year. He's not a king; he has to work with Congress. He's done a lot already and I'm optimistic that he is becoming more knowledgeable about how to get his ideas implemented. Yes, he lost time trying to work with Republicans, but I think he's seen that compromise with those who won't compromise is not a promising strategy. I thank you for writing this post for I also believe our President inherited a big mess... he is trying but how can anyone fix America in 12 months or less? Julie, you are making a very good point! A lot of folks are saying: we’ll give you a year to work miracles and if you don’t immediately fix everything, we’ll turn on you. I don’t understand why a majority of Americans were not proud that their president was honored with this very prestigious award. In a sense this was an award to the American people as well as to Obama. 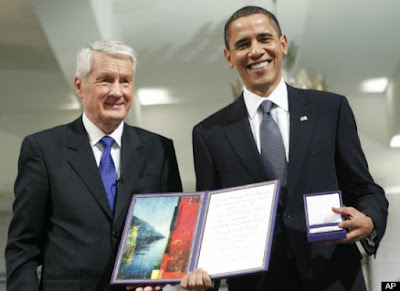 The Nobel committee was thanking us for ending 8 years of destructive policies and for overcoming our history of racial discrimination (or more accurately taking a giant step towards overcoming this shameful history.) Obama’s election offers hope to people around the world that racism can eventually be overcome. Maybe the American people should have been the ones to receive the Nobel prize for voting for Obama and overcoming racial discrimination.